How long does a trip to the Garden usually take? Travel to the Garden from Old Town Puerto Vallarta takes approximately 30 minutes. The length of time you spend at the Garden depends on your schedule and what you’d like to do. You can hike along our trails, swim in the river, visit the orchid conservatory, have a bite to eat at the restaurant, take a guided tour and much more! We recommend giving yourself at least 2-3 hours for your visit, but some choose to stay for the whole day or even come back again and again. 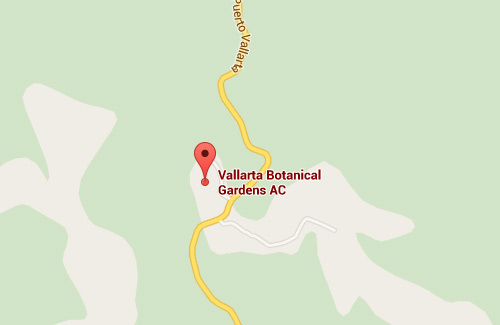 We are located 24 km south of Puerto Vallarta on the scenic Palms to Pines Highway. The Garden is easily accessible by bus, car or taxi. Click here for location and transportation information. Our PHYSICAL address is: Carr. Pto. Vallarta a Barra de Navidad, Km 24 Las Juntas y Los Veranos, Cabo Corrientes, Jalisco, Mexico. Please note that our mailing address is different. See home page. Just $200 Pesos per person! We are open from 10-6 seven days a week. Between April 1st and November 1st, we are closed on Mondays. On Thursday mornings we offer early morning birding at 8am. Note: We are closed on Christmas Day and New Years Day. As a small non-profit heavily reliant on memberships and donations, we also rely on the Hacienda de Oro Restaurant’s contributions to maintain our general operations. For this reason, no outside food or beverages are permitted on the property. Pets are welcome when kept on a leash in their owner’s control and their waste is picked up immediately with a plastic bag. Extra fees of $50 pesos per dog applies. Member’s pets get in for free. Your dog may not run off-leash. Please control your dog and do not allow it to approach children or other dogs. Several areas of the Garden are accessible—including the Vallarta Conservatory of Mexican Orchids, Hacienda de Oro restaurant, Garden Gift Shop, aquatic plants pond and the Flag Trail. Trails going through the jungle are not accessible. Yes! The Vallarta Botanical Garden is offering its own guided tour to this world-famous garden destination and pristine nature reserve! This exclusive experience immerses guests in both the natural beauty of Mexican plants and the richness of authentic Mexican cuisine. Please click here for more information. We also offer birding tours upon request. More information can be found on our tours page. Why should I donate to the Garden? As a nonprofit public benefit organization, the Vallarta Botanical Gardens relies on the contributions of our members and donors to sustain this natural sanctuary, continue much needed conservation projects, and further our outreach to the Puerto Vallarta region’s community. The Garden receives no funding from the government, which means that we rely on your support to remain open. Donations and memberships help raise awareness of environmental needs, contribute towards important tourism generating, support a world-class community resource and create environmental education programs for the communities youth. How can I donate to the Garden? Yes! We are always looking for volunteers to assist in a variety of work such as plant propagation, gardening, administrative assistance, graphic design, translating (not just to/from Spanish! ), education, leading tours and many other areas. Some of these tasks can be done without being at the Garden or even if you are in another country. If you are interested in volunteering, please look at our calendar of events to find the next volunteer training day or email ­­­­­­­­­­educadorambiental@vbgardens.org with any questions you may have. More information on volunteering can be found here. May I do a photo shoot at the Gardens? Permits are necessary for professional photo shoots or any organized photography. The basic photography permit of $1,000 MXN admits one photographer and one model or assistant. DRONE photography $500 MXN extra. Standard garden entry fees apply to additional guests and to arrange this in advance by calling +52 (322) 223-6182. For any additional questions, please email info@vbgardens.org or call (322) 223-6182 or (322) 223-6184.